Interested in Learning how to Play Bingo? The game of Bingo is one of great simplicity but also of enormous fun and excitement. Bingo evolved from the older game of beano and with slight variations became a huge success in the United States and eventually across the world. All that one needs to play a game of Bingo is a card, a marker of some sort and a caller. The caller presents the numbers of each turn and announces them as players review their cards to find if they have any matches. Players are often able to play as many cards as they care to purchase with many serious offline players consulting quite a few cards throughout each session. There is a free space located on the average Bingo card that is immediately marked, then players must hope for the best trying to get a straight or diagonal line so that they get a “bingo” and win the game. The numbers are determined in various manners from simple means like grabbing from a basket or the more popular “blowers”, machines that use air to push ping-pong like marked balls around a chamber before they are selected. Sessions of Bingo typically last until a player has been able to mark enough spaces on the card to form a line and claim the prize. Bingo is a game of luck and there is no active skill necessary in order to win. Players watch over cards as numbers are called out at random and as mentioned before, mark spots in hopes of getting a line. Although most games of Bingo typically require the player to be able to mark one line or four corners there are different variations that are defined at the beginning of a session. Some halls or websites will require a blackout or an entirely filled in card while others may only need a simpler shape. Bingo wins can range within an enormous variety of necessary shapes including one or two lines to four corners, T or diamond shapes, and inner squares. Essentially the pattern required for a win is set out by the game in question and players need only to pay attention at the onset to know what will entail a win for the session. 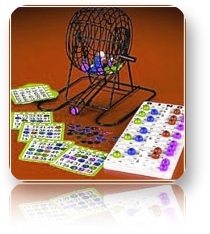 Bingo is one of the games that have ended up profiting in a significant manner by the advent of popular technology. With the use of random number generators the game has been able to continue forward with a much simpler method of calling. Online casinos have also capitalized on Bingo as a great game that can benefit from the simplicity involved with internet “cards” and randomized number generators. Instead of being bogged down by printing unique cards and developing or purchasing systems for callers to use, technology has made Bingo easier than ever to play. As online Bingo rises in popularity and new players discover the fun elements of the game it is evident that the classic game of chance is here to stay no matter which form it takes.